When the first Discworld adventure game was released in 1995, the development team must already have been hard at work on a sequel, because the next installment of the series had already followed at the end of the next year. By that time I was already deeply ensconced in Discworld lore, having discovered Terry Pratchetts books through the first game. 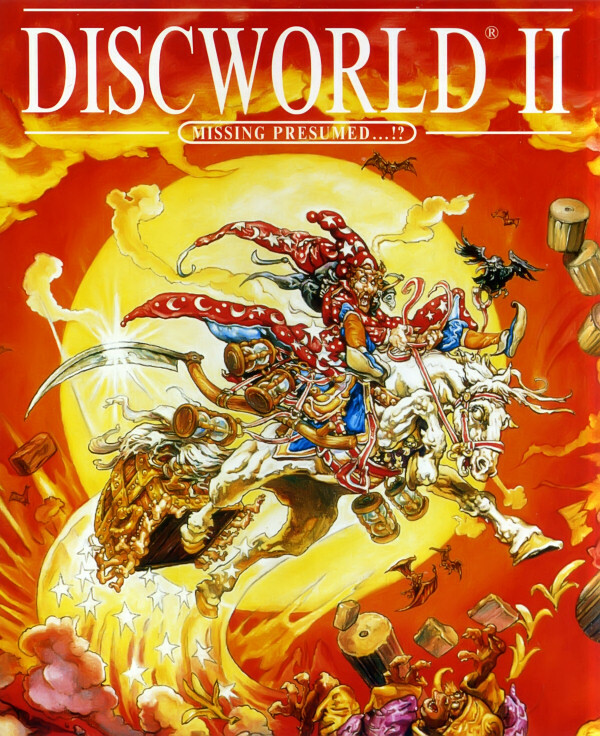 Despite the quick successive release, Discworld II was exactly the opposite of a hastily churned out sequel – quite to the contrary, it turned out to be an amazing improvement on all aspects of the original. More refined graphics with impressive hand-drawn animation, the same entertaining voice acting led by Ex-Python Eric Idle and a proper new Discworld story with familiar elements, it turned out to be another instant classic – and sadly the penultimate game of the series. 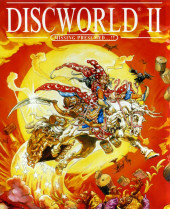 In 1996, 21 years ago, the Discworld was back on the computer screens, bigger, better and funnier. Time to take a look back for the 20th anniversary, which I sadly missed last year. Thimbleweed Park – The Return of Lucasfilm Games! 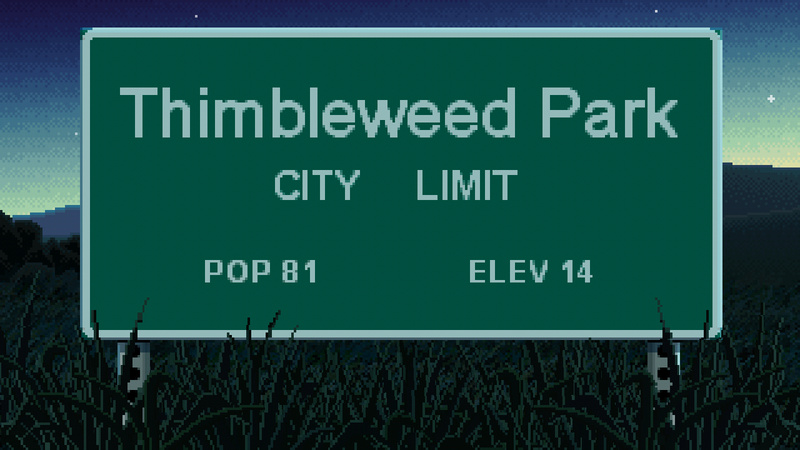 Two years ago, I wrote an article about Thimbleweed Park, the Kickstarter-funded adventure game project from Lucasfilm Games legends Ron Gilbert, Gary Winnick and David Fox – and then sadly never got around to mention it again. In the meantime, the game has been successfully developed – which was extensively documented on their website – and finally released this Spring. Ironically, I was not able to play the game in its PC version because, despite its retro look, the engine has some requirements in the graphics department that made it impossible to run on my aging computers! But recently, more than half a year after the initial release, the Android port has finally been released and to my delight it runs on my tablet and phone. Time to go back to 1987, which is very appropriate since 2017 is the 30th Anniversary of Lucasfilm Games’ first point-and-click adventure Maniac Mansion! 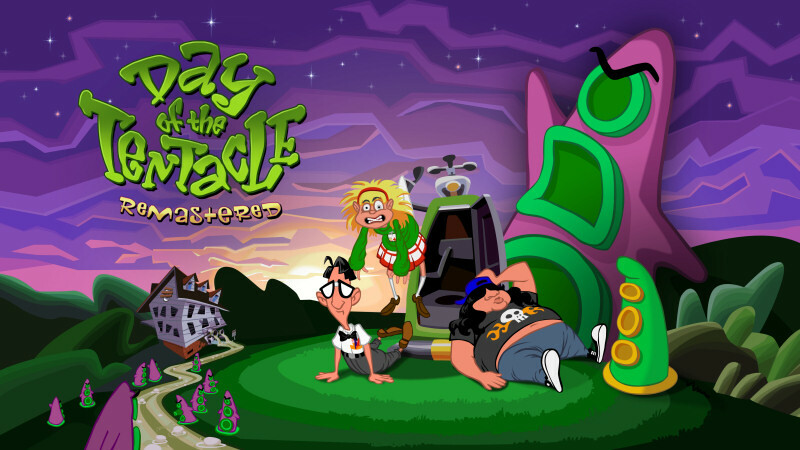 Several people have asked me why I haven’t yet said a peep about the new remastered edition of LucasArts’ classic adventure Day of the Tentacle – and there are actually only two reasons: it’s probably not going to run on any of my current computers (which is somewhat ironic!) and I simply haven’t gotten around to it yet. 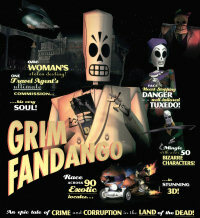 So, after my skeptical opinion about the new version of Grim Fandango last year, what’s my take on this one? In short, I think it’s awesome – from what I’ve seen in the Trailer, the Making Of and in some other Youtube videos, this is a whole different effort than Grim Fandango and more in the style of the two Monkey Island remasters that were made some time ago. This means that the whole artwork has been redrawn from its 320×200 original, something which makes a lot of sense since the background and characters were originally hand drawn. There were actually some rumours that the sad remnants of LucasArts had tried to do a pseudo-3D version of the game shortly before they were bought up by Disney, although this upgraded 2D rendition is a much better approach and stays completely true to the original. The artwork is actually so precise that it looks like a pixel grid was removed and the voices and music were also remastered, but I think the original version is still one of the best adventures ever made. One of the reasons I’m not really rushing to get the new version which would probably fail to run on my old machines is that I’ve played DOTT at least three times from beginning to end in the last couple of years – once even on my Android tablet. So I’m not particularly keen on playing it again at the moment – but rest assured, I will go and play it at some time in the very near future, maybe when an Android version is going to be released! A long time ago back in 1995, I accidentially discovered an interesting game package in the computer section of a local department store – it had the simple title DISCWORLD, an intriguing cover illustration and billed itself as an adventure game from the world of a certain Terry Pratchett, of whom I had not heard before. What actually got me to buy the game, though, was the voice cast – Eric Idle of Monty Python fame lending his voice to the main character made this game absolutely irresistible for me and practically an obligatory purchase. Of course, it was through this game I discovered Terry Pratchett in the first place and this beginning could not have been better. 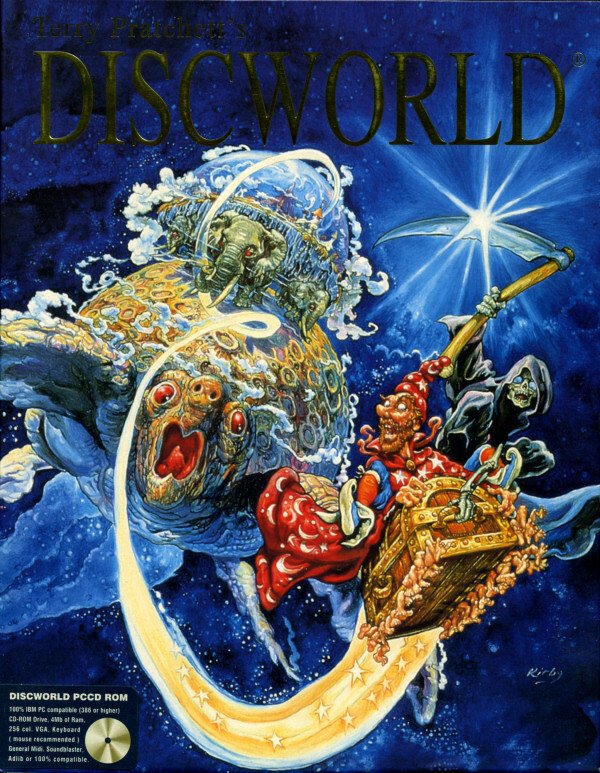 While Discworld, the computer adventure, had some minor problems and was not easy to solve, it embodied the quirky style of the author perfectly. Twenty years after its first release, it can rightfully be seen as one of the classic adventure games of the era and at the same time a successful literary adaption. Let’s have another look at it for the 20th anniversary – it’s almost unbelievable that it has already been that long! 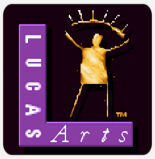 More than 25 years ago, they made great adventure games for Lucasfilm Games. Now they’re getting the band back together. You have to hand it to Tim Schafer, former LucasArts games developer now gone independent with Double Fine Productions – he really loves his old classics. At the beginning of December, there was the amazing announcement that his company would not only remaster Grim Fandango, but also Day of the Tentacle, the 1993 sequel of Lucasfilm Games’ adventure debut Maniac Mansion. Those news made me all nostalgic because I really love those games and while I completely agree that Day of the Tentacle will really benefit from a remaster especially in the graphics department, I’m not completely convinced about Grim Fandango. I hate to be the voice of criticism here, but when I pulled out Grim Fandango a couple of days ago for the first time in maybe ten years or more, it still looked impressive to me, especially considering the game is over fifteen years old today and used only a resolution of 640×480 pixels – it might not be enough for a huge television set, but the OpenGL rendering of ResidualVM with an anti-aliasing filter on the 3D models makes the game appear very smooth. Upscaled on a 17″ 1280×1024 monitor (that’s about the same height as a 22″ 16:9 display) it still looks nothing short of amazing and only a little bit pixelated. This is not completely unsurprising, but nevertheless very sad news: Disney, who bought the whole Lucasfilm empire last year from its founder George Lucas, announced that it will close down LucasArts. The games division of Lucasfilm had been in trouble for a number of years and the original company, which almost single-handedly had invented the point-and-click adventure game in the late 1980s with Maniac Mansion, has long ceased to exist. Their last true adventure game, Escape from Monkey Island, was published thirteen years ago in 2000 and from then on the almost exklusively focused on Star Wars action games. Sequels to Full Throttle and Sam & Max were even cancelled as late as 2004. There had been a glimmer of hope in 2009, when LucasArts had allowed Telltale Games, who had already been doing a series of Sam & Max adventures, to rejuvenate the Monkey Island franchise with Tales of Monkey Island, a story told in five game episodes. In parallel, LucasArts themselves released new versions of the first two Monkey Island games with new artwork and full voice acting. While it seemed that LucasArts at least cared a little for their legacy games, nothing more had been forthcoming since then apart from some rereleases of a couple of other adventures with Windows engines. So this is not actually the end of an era, and judging from the press releases the name LucasArts is not actually going to disappear – Disney is just going to outsource the game development to other companies. But that means people have been laid off at LucasArts – and in the current economical climate, that’s the actual sad news. But LucasArts is not alone – none of the great adventure game developers of the 1980s and 1990 exist anymore today. I’ve actually been working on a kind of tribute site for the LucasArts adventures for a long time now and the project has been somewhat made redundant by the emergence of Wikipedia – which is not necessarily a bad thing. But I might just give it another shot and rebuild the never-finished games section of this website not only for LucasArts, but for other all adventure games. Maybe!